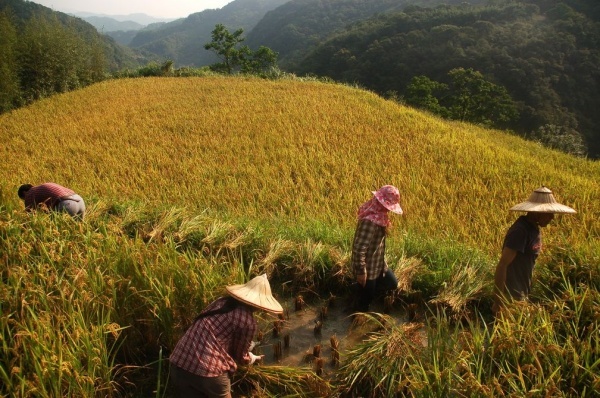 Since 2011, the Forestry Bureau, COA, has been subsiding EEFT for promoting the "Gongliao-Terraced-Paddy-Field Conservation Program" in the Shungxi River Valley, which is one of the largest watershed in Northern-Eastern Taiwan. 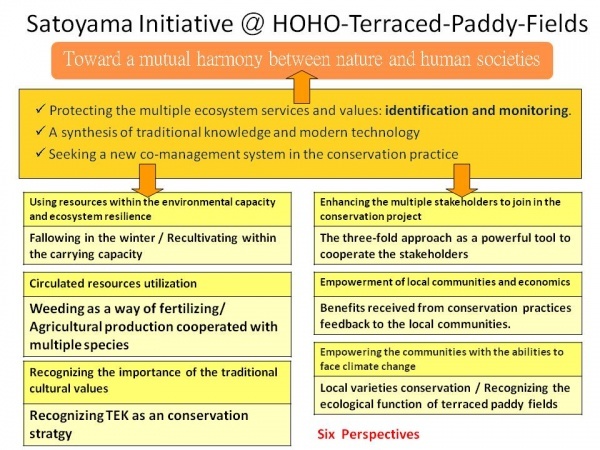 This program, which has collaborated the related stakeholders and the authorities, has been intending to protect the threatened terraced paddy fields, especially the ones cultivated in a environment-harmonic way, have great potency in connecting neighboring water corridors used by aquatic species, and maintaining regional water resources. In 2015, there is 7ha of terraced paddy fields co-managed with the local communities and authorities. 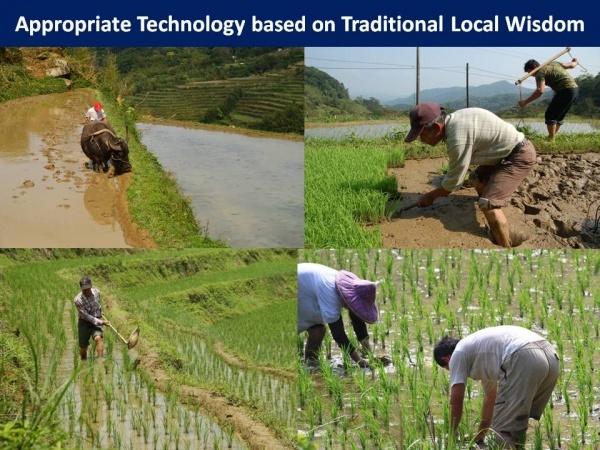 The cooperated terraced paddy fields are cultivated in "Ho-ho Principles", which evolved from the traditional agricultural knowledge, and stand for a certification for the agricultural products. Besides the agricultural production, eco-tourism and environment-awareness education have extended the financial supports to the local communities, and leveled the comprehension of the public. Therefore the promoter of the conservation actions will transfer to the local communities gradually. Gongliao-Hoho-terraced-paddy-fields, Threatened habitat and species, Aquatic ecological corridor, Freshwater recharge, Traditional agricultural technology, Ecological-stakeholder participation, Payment for ecosystem services. 1. FangYun-Ju , Environmental Ethics Foundation of Taiwan, the director of GTPF conservation program. 2. Shiue Bo-Wen, Environmental Ethics Foundation of Taiwan, the co-executioner of GTPF conservation program. 3. Hsieh Chuan-Kai, Institute of Ecology and Evolutionary Biology, National Taiwan University. 4. Lin Wen-Tsui，the founder＆director of Mong-hoho Barn Company. Gongliao located at the rainy low-elevated hill area in the Northern-Eastern Taiwan. Over the past 160 years, numerous farmers had built thousands of hectares of terraced paddy fields in the winding Shuangxi River Valley. However, the area of terraced paddy fields has been decaying since 1980s, in 2010, only 10ha of terraced paddy fields were cultivated in this area. 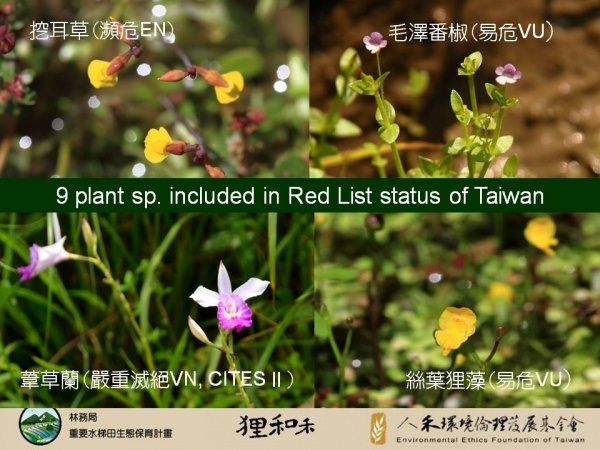 Due to the massive modernization in agricultural production, most paddy fields in the low land area have been cultivating with heavy dosage of chemical fertilizers and pesticides, suffered severe invasion by the destructive golden apple snails (), and shorten flooded period. Therefore, the local aquatic species, includes fresh water fishes, plants and insects, are now facing great pressure due to the habitat degradation, and no reliable conservation actions had been promoted in this area. The remained terrace paddy fields in Gongliao behave as the last refuge of these precious species, which leaded the Forestry Bureau to subsidize EEFT to advocate the “Gongliao-Terraced-Paddy-Field Conservation Program” in 2010-2015. The aims of the program were to find practical strategies combining the agricultural benefits and biodiversity conservation, furthermore, to seek the now co-management system between the local communities and authorities. 《Figure2》The local agricultural production is rice, which harvested once a year, in July or August. In the fallowed half year, the terraced paddy fields are flooded, thus become a fine habitat for the wild life. By operating environmental survey and participated in the agricultural production, we have confirmed the “Ho-ho Principles” is an adequate conservation tool to match the need of local communities. Until 2015, we have recorded 511 species, includes plants, aquatic insects, fresh water fishes, decapods, mollusks, and mammals in the cultivating terraced paddy fields. We also recorded 106 species of aquatic animals, includes many migratory species, in the streams related to the terraced paddy fields. (1) The terraced paddy fields keep water constantly, which provide fine habitat for the aquatic species. (2) The terraced paddy fields provide water resource for animals distributed along the edge between forest and grassland. (3) The terraced paddy fields connect the in-land water body, which behave as the corridor of the migratory species, thus enhance the productivity of river and near-coast area. (4)The terraced paddy fields stabilize the water quality and quantity in the down-stream rivers through rainfall water detention in the terraced paddy fields. (5) The ecosystem service of groundwater infiltration in the terraced paddy fields benefit the down-stream area, which enhance the water quality of the purification plant. Thus the terraced paddy fields have great effort to stabilize the local livelihood water resource. (6) Advocating pesticide-free agriculture and creating a brand of forest-gathering honey, which protect the pollinators in the mosaic landscape. 《Figure3》Stable and pesticide-free wetlands are fine habitat to many threatened species. 《Figure4》 The terraced paddy fields have many ecosystem functions, namely detention, infiltration, and flood regulation, which stabilized the water support in the down-stream area. 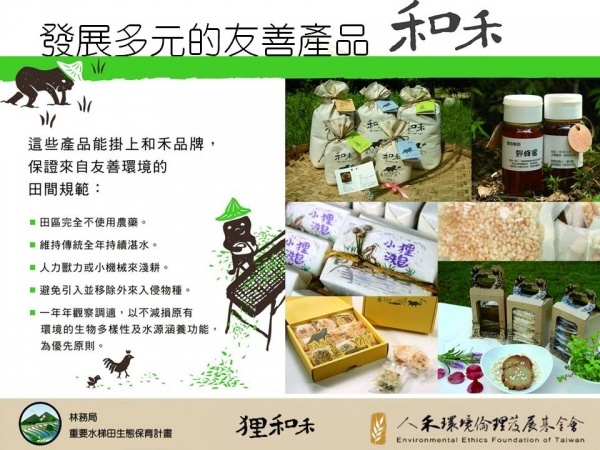 The Ho-ho Cooperation, which organized the local farmers, has been operating environmental-friendly agricultural management. From 2011 to 2015, the area of conserved terrace paddy fields has had a growth from 2.4ha to 7.0ha, and an extra 3ha recultivated terraced paddy fields which are not included in the conservation program. A local social business, Mong-ho-ho Barn, was established under the program, acting as secretariat of the Ho-ho Cooperation, and managing the environmental industry. We have used several strategies to thrive the development of co-management systems, includes: the establishment of local cooperation, advocating the public as well as the authorities to recognize the conservation values, sustainable economic supports, and a SCOT (Subsidize-Coach-Operate-Transfer) approach to promote local empowerment. Meanwhile, by operating PES, guarantee price and processing in the rice production, we have enhanced the income of agricultural production. The eco-tourism and other environment-friendly industries keep the interest produced by the conservation program in the local communities which paid great effort in taking care of the land, and promote the understanding of the ecosystem function of terraced paddy fields to the public. Among the past 5 years, the consensus if local development and cooperating mechanisms have been established gradually, we highly recommend the administration to empower the PES executive to the local cooperation. Through the empowerment, local communities will benefit from the sustainable environmental industry, thus provides a financial input to maintain the economic growth and ecosystem services. 《Figure5》Ho-ho Rice and the various side products. The Gongliao case is precisely the response to the Three-fold Approach of the Initiative. (1) Securing the diversified ecosystem services and values: the previous surveys and the local ecological knowledge confirmed the conservation targets, namely the habitat of threatened species, water resource management, and the productivity of terraced paddy fields. These values and knowledge were communicated with the residents and the public. (2) Integrated the traditional knowledge and modern technology: using the traditional farming knowledge as a modern conservation tool, which facilitates the habitat resilience, and stabilizes the local environment by applying local monitoring system. (3) Co-management system construction: redefine the environmental stakeholders within the scope of ecosystem services, and united the stakeholders into the conservation and economic production networks. Using resources within the environmental capacity and ecosystem resilience: we have practiced a ranked price system to lead the cooperated farmers to produce rice in an environmental-friendly way, which is capable with the conservation purposes. The eco-tourism is operated within the environmental capacity, which was defined by the local ecological knowledge and the cultural principles. The recultivation of terraced paddy fields has been limited in the grassland which was the fallowed agricultural land, thus made no disturbance to the forest landscape. The honey collection has been operated under the traditional methods, which has strict timing and practical restrictions, and made no negative effect on the population of honey bees. (2) Circulated resources utilization: we have encouraged the cooperated farmers to cultivate in a traditional manner, in which the farmers were all experts. The traditional methods, for example, we weed manually and tilt in the appropriate season, to circulate the nutrients within the terraced paddy fields. We take care of the aquatic plants, predators and other ecological guilds, and recognized them are all part of the agricultural production system. One of the traditional buildings in the community was renovated by the residents, utilizing the traditional skills, and function as a teaching center of eco-tourism and a grocery of local agricultural products. (3) Recognizing the importance of the traditional cultural values: we have established the agricultural managing principles in the manner of traditional farming skills, which includes an ancient manual pest control tools made by bamboo. We also empowered the farmers to guide the eco-tourism, the empowerments, which emphasis the interpretation and practices had great importance in the inheritance traditional wisdoms and skills. (4) Enhancing the multiple stakeholders to join in the conservation project: we have identified the environmental stakeholders of the terraced paddy fields, promoted the “conservation partnership”, and developed multiple methods to enhance the consumers to participate the conservation industry. (5) Empowerment of local communities and economics: we have been practicing the PES and confirmed its efforts. Currently the PES operated by the authorities, which was designed to support the environmental friendly agriculture and recreation business, could contribute a marginal benefit of 370%. The local government’s tourism development projects were cooperated with the Ho-ho Cooperation, and promoted the business social responsibility investment. 《Figure6》Six Perspectives Method in Ho-ho case. 《Figure7》 The traditional farming knowledge is a powerful tool in the conservation programs. 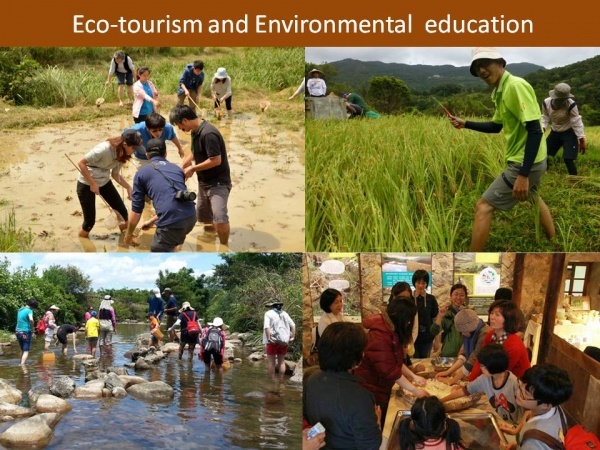 《Figure8》The eco-tourism and environmental education developed lately enhanced the income and strengthen the understanding of ecosystem services to the public.